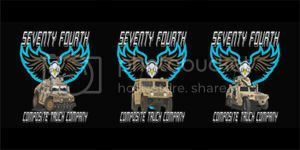 I've been working with what many say is one of the largest units @ Ft. Campbell, KY Home of the 101st Airborne Screaming Eagles and little old me has the Honor of doing a new Unit Shirt Design. This is where we are down to, same look, different trucks. And I can print it to look just like that. I think they are leaning toward the toon one.